Ather Shahzad is professionally a single entity shared by two men who have become the media and fashion industry’s most famous names. They are favoured by celebrities and models for their Breathtaking photography and, more recently, make up techniques to transform the fair-to-middling into unforgettable faces. Athar and Shehzad could not have been better rewarded for gliding smoothly out of the ‘others’ shadows than winning the Lux Style Awards two years in a row. The most sought after award of the media and fashion industry, Athar and Shahzad won it last year for best photography, reconfirming their lead over the ‘others’ by winning it again this year for best make up artist and photographer. There was much air-smooching authenticated by such endearments as ‘congratulations jan!’ and ‘I’m thrilled jani.’ But beneath all that professional rectitude lay jealousy, envy and the urge to rip them apart. They would do anything. And for starters, the ‘others’ thought of driving a wedge between the two friends who had spent much of their childhood together, gone to the same college and stumbled collectively to reach the stage set for the awards. It has been nearly 15 years now that the duo from Sheikhupura took up professional photography. Self-taught and inexperienced, their work instantly appealed to the fashion industry struggling for recognition. Their first photo shoot in 1993 of Zeba Bakhtiar, the face of the early ’90s, in sepia made many actresses run over each other to be captured by Ather Shehzad’s camera. Zeba’s photo shoot had formally established them as professional photographers. They shot every known face of the country. Soon, covers of fashion magazines and newspapers’ centrespread were putting Ather Shehzad in their credits for photography. Fashion designers approached them to suggest models for catwalk shows and fashion photography. 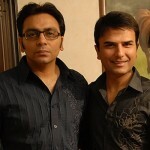 Ather and Shehzad launched many faces. It only required a modest, telephonic request by Ather and Shehzad (mostly Shehzad) to make Lollywood actors, used to hot pursuits by directors and producers, to do a photo shoot for a magazine or newspaper. Many girls want to have their make-overs as well as photo shoots on their wedding not from any one but only Athar Shahzad, the stylist and photographer who has his own salons and studios exclusively for those who want to be different yet charming. Now it’s been more than 15 years, he is working in the Pakistan’s Fashion Industry.